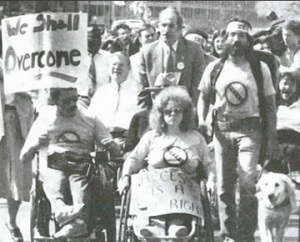 We look at the 25th Anniversary of the Americans with Disabilities Act (ADA), with Virginia Knowlton Marcus, Executive Director of the Maryland Disability Law Center. You can join Maryland Disability Law Center at their “Breaking Barriers 2015” gala event Sept. 24, 2015, celebrating the ADA’s 25th Anniversary, at 5:30pm at the Wright Theater at the University of Baltimore Student Center, 21 W. Mount Royal Avenue. There will also be a screening of the outstanding Independent Lens documentary, “Lives Worth Living”. Click here for tickets and more information.